Sync and Share Outlook Folders. Synchronize and share Outlook Personal Folders (.PST file). Share calendar folders, appointments and meetings. Share Outlook tasks. All flags and Read/Unread Status are synchronized as well. Share custom Outlook calendar forms and imported items. Sync and share calendar folders, appointments and meetings in a few clicks. Synchronize and share outlook calendar items automatically or manually. Share Outlook Folders with your own custom forms and imported items. Sync2 is a convenient and cost-effective tool for sharing personal Outlook folders with others. Free 7 days free trial. No credit card. Outlook Exchange Folders (.OST files) can be shared and synchronized with other PCs without accessing Exchange server. Synchronize and share Outlook folders, share Calendar and team tasks. Share different Calendar folders with your coworkers, friends and family. 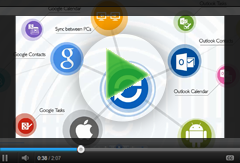 Synchronize and share Outlook items automatically or manually. Share custom Outlook forms. Your synchronized Outlook data is available for editing even if you are offline.